A 20-foot blue spruce, along with a birch, crab apple, dogwood and Japanese maple, are part of what is essentially a giant container garden built on top of a narrow asphalt driveway in Buffalo. 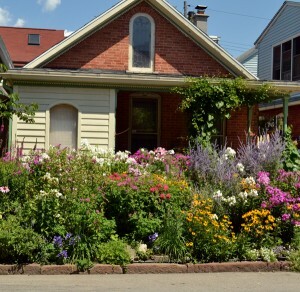 Ellie Dorritie of 415 Summer St. shared her gardens during Garden Walk Buffalo on July 30 and 31. More than 350 gardens were on display during the event, which is the largest garden tour in the nation. Dorritie’s back garden includes brick pathways, which you can see below right. 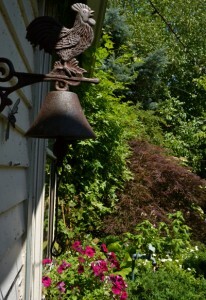 In addition to the trees, there are hydrangea bushes, juniper, porcelain berry (a vine that gets blue berries), ivy and other ground covers, roses, clematis, and barberry (not a dwarf, Dorritie notes). During the walk, visitors puzzled over which plants are in pots. Dorritie displayed a diagram during the walk that explains that, like a rooftop garden, everything in her garden is in pots. 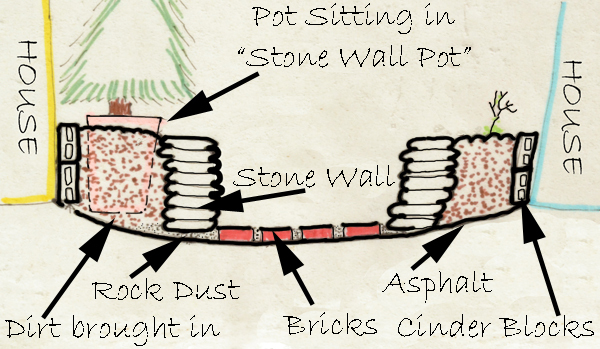 The raised beds held in place by stone walls are themselves a container, and pots are set into the raised beds.You can see the diagram below left. All the plants stay outside during the winter. “They wouldn’t fit in the house!” Dorritie said. The microclimate at her home is very different from what you might find in Lancaster or Eden, she said. First, her home is close to the Niagara River, which gives her more of a peninsular climate than a U. S. mainland climate. Second, the street is very narrow and tightly packed with brick houses. That helps to retain heat. 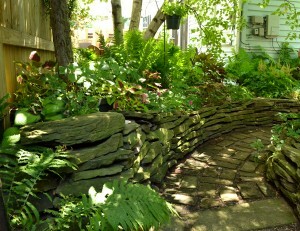 While her back garden is more protected and shady, the front garden, which fills her entire front yard, is sunnier. I have many of the same plants in my garden that Dorritie has in hers, but I have to admit, mine don’t look as good as hers do. She remembers a picture she saw of a window box on a house. A flood had brought water lapping just inches below the window. Still, a woman reached through the window with a watering can to give her flowers a drink. You can’t spend just 15 minutes and think you’ve adequately irrigated your garden, Dorritie said, and the image of the woman watering her window box helps us remember that gardens– especially container gardens– need a great deal of water. Watering is important for her backyard, she notes, since it is planted on top of asphalt. In addition to maintaining her own lovely landscape, Dorritie is involved in a community garden. She finds that gardening has a deeper meaning for her. “Gardening is a cooperative venture where we get to know each other and to trust each other,” she said. “We learn that we can do things. I only had a couple of hours this year. The cottage district is my absolute favorite, all the sweet little houses, brick and all the amazing gardens are a joy to share with others. Sorry I missed this part, certainly will be there next year. Dorritie has a special touch and love for gardening. Thanks so much for your comment. 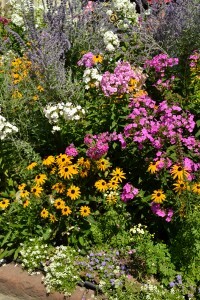 I think that’s the problem with all the garden walks in Western New York– So many gardens, so little time. Ellie Dorritie is wonderful. I hadn’t even read the description of her garden before I decided I wanted to interview her. She just seemed knowledgeable and so willing to share. It was a delight talking to her. I enjoyed this post as I too had talked with Ellie and she is a remarkable woman. So much to see on such a tiny lot. And I did not know she planted directly over the asphalt. When talking with her, I thought she removed it when she did the back yard. Pretty amazing all this grows there. It is pretty remarkable, isn’t it? She compares it to a rooftop garden. I think the best part of my job is talking to all the gardeners. They all have such great stories!